All you need to make a good hearty soup are a couple of onions, a little garlic, some tired old vegetables, some cooked beans, grains, or pasta, and the courage to proceed without measuring. Bon Appetit! Note: Here’s how to prepare dried beans—the best is to soak them overnight in cold water, then cook them in fresh water maybe with onions and herbs until they are tender, discarding the cooking water. The next best is to put the beans in a pot with plenty of cold water, bring it to a boil, cover and turn off the heat and let sit for one hour, then discard the liquid. 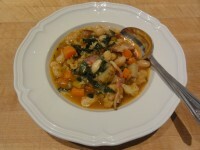 The beans can now be added to soups, stews, and other dishes.